Breeze through setting up licenses and permissions for Analytics apps. Assign user permissions so your team can access apps. 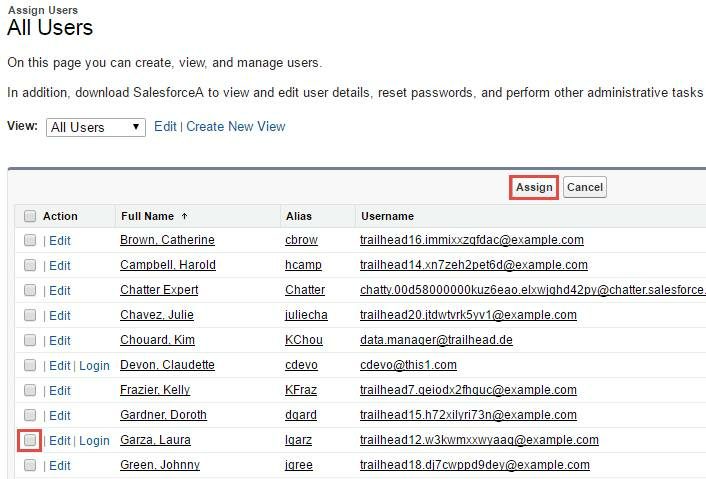 Set up access permissions to sensitive Salesforce data. This unit uses the Sales Analytics app as an example. The principles and techniques you learn can be applied to setting up licenses and permissions for any Analytics app, and any kind of app user. Let’s get you going in your adopted role as analytics guru for DTC Electronics. Today, you’ve been bombarded with requests to set up Sales Analytics. So, let’s learn how to do that quickly, and maybe have a little fun in the process. After ensuring that your Analytics app is enabled, we’ll give other people access to it, and then we’ll determine what they’re allowed to do. Remember—the same basic techniques apply to any prebuilt Analytics app. Ready? These instructions use Sales Analytics for all the examples and details. The same principles apply to setting up permissions for other prebuilt Analytics apps, such as Event Monitoring Analytics and Service Analytics. For detailed instructions about setting up permissions for other apps, see the resources section, below. The org already has two active users. Yes—one is you! The other is Laura Garza, one of DTC’s sales managers. The account you’re using right now, set up specifically for this trail, has complete admin privileges for that org. Your life would be so simple if that was the only account you needed. But in real life you need to meet the needs of many users, with various roles, each requiring various levels of access. Trailhead imitates life: Laura Garza has been bugging you about Sales Analytics. Her CEO is about to fly in for a meeting, and although Laura has access to Analytics, she wants access to the Sales Analytics app as well to show how her team is doing this quarter. Give her permission to use Sales Analytics. Create a set of permissions and assign it to her so she has the access she needs to get ready for her meeting. Not everyone can handle the awesome power of having access to all things Analytics. Let's create a permission set specifically for sales managers—just enough to do what they need. You don’t want the sales manager and other users to be able to do everything you can do as an admin. Analytics lets you control security at a very granular level for every Analytics app. So you’ll create that permission set to make sure she has access to just what she needs to do her job. So, now let’s see what Laura has permission to do in Analytics. To do that, you first need to make sure it’s enabled. If you’re using the org provided for this trail, we’ve made it easy for you; Analytics will already be enabled. You don’t need to do anything. In the real world, you’d see this big stylish Enable Analytics button the first time you opened Analytics from the app menu. The first part of the process involves creating a permission set, and associating it with a PSL. Before you can select any PSL for Analytics, you must have purchased an Analytics license. You can purchase either the Analytics Platform license or a license for a specific Analytics app—or both. Next, you add some permissions to the permissions set, from those available in the PSL. Then you can then assign that permission set to users, in this case, Laura. Clear as mud? Here’s an analogy that might make things a little clearer. A PSL is like a passport. It grants you the right to travel, but you can't visit the great land of Analytics without the right visa. A permission set is like a visa. You can get a three-day tourist visa, a work visa, and so on, each of which allows you to do certain things. To do everything you want to do, you need both a passport and a visa, which is why you need to assign each user at least one PSL and one permission set. As the admin for DTC Electronics, you control access to Analytics. Let's create a permission set for sales managers like Laura. In the real world, you’d probably do this for many users. Using the passport analogy, we’re now at the point of granting visas to go to certain places and do certain things. Since this permission set is for Laura, and other sales managers who just need to see a Analytics app (and not create or customize it), type View Analytics App in the Label field. Adding the label automatically creates the API name as well, which we’ll keep. In the Setup menu, under Administration, click Users, then Permission Sets and then click New. Enter View Analytics App in the Label field. This automatically creates the API name as well, which we’ll keep. From the License drop-down menu, select the license to associate with this permission set. 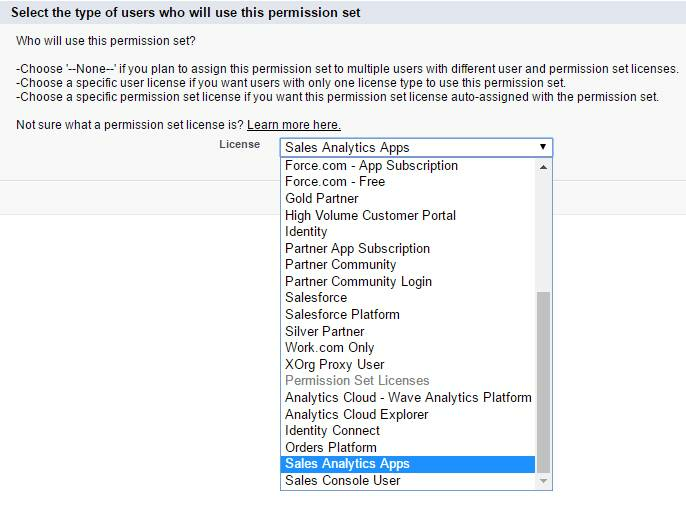 In this case, select the Sales Analytics Apps permission set license. This step is equivalent to the passport in our analogy. If you select a specific permission set license, any user assigned to the permission set is auto-assigned the permission set license. If you leave the default of --None--, you must manually assign the permission set license to users before you can add them to the new permission set. Of course, auto-assignment mean less for you to do! Click Save. The Permission Set Overview page shows the new permission set. Now add user permissions to the set. When you created the permission set, you also specified the PSL to associate with it ("Sales Analytics Apps"). This PSL makes a specific set of permissions available to assign—but they haven't been granted yet! You need to figure out which permissions are appropriate, and then assign them to the permission set you plan to assign to users. So, essentially you’re going to create a subset that's right for sales managers like Laura. You won't give her all these permissions. There are more Analytics permissions for other license types, but these are the ones available for the apps license. Use Analytics Templated Apps. This permission is for users who need access to any Analytics apps. Using the passport analogy, this is a visa that lets you roam, but you still need a specific visa to get a job, be a student, and so on. Laura already has this permission. She can access Analytics, but not apps like Sales Analytics. Access Sales Cloud Analytics Templates and Apps. Another user-level permission, this lets you use only the Sales Analytics app and all its data and dashboards. Each Analytics app has a similar user permission. For example, the Service Analytics PSL enables the “Access Service Cloud Analytics Templates and Apps” permission. You need the "Use Analytics Templated Apps" permission for this permission to work. So this is the visa that let’s you be a student or get that job! Manage Analytics Templated Apps. This is an admin-level permission that lets you create, share, and delete apps. You should be careful about assigning this to users like Laura, who probably won’t need to create apps. Edit Analytics Dataflows. Another admin-level permission. You use this to do app customizations that involve changing app data. As such, it’s for advanced admins who are comfortable with editing a bit of JSON. Don’t worry if you don’t know what JSON is. Download Analytics Data. Download screenshots and data in tabular format through the Analytics user interface. Trend Report Data in Analytics. Track data over time using trending in Analytics to visualize and share insights from your ever-changing business data. We will only assign some of these permissions. Now let’s add the right user permissions to the set. On the permission set overview page click System Permissions. If you closed it by mistake, in Setup go to Users—>Permission Sets, and click View Analytics App to reopen it. 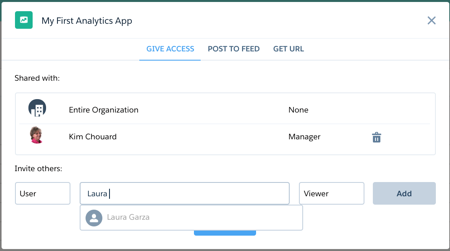 Since we’re creating a permission set called View Analytics App just for Laura (and users like her), select the checkboxes for the permissions that enable that level of access: Access Sales Cloud Analytics Templates and Apps and Use Analytics Templated Apps. Also, if you were creating permission sets for users of another prebuilt Analytics app, you’d select the specific user permission for that app. For example, if you’re setting up user permissions for Service Analytics, you’d select the “Access Service Cloud Analytics Templates and Apps” permission. To learn more about creating permission sets for specific apps, see the resources section, below. For now though, you’re just setting up Sales Analytics so you don’t have to look for any other permissions. Wow—you’ve successfully created a permission set that lets Laura view the Sales Analytics app. Only one last task to wrap everything up. Almost there! You just need to assign the new permission set to Laura. You’re nearly ready to let her loose in Sales Analytics (and get back to your other work)! Let’s get Laura that visitor visa! In Setup, click Permission Sets. Click the permission set you just created, View Analytics App. Select the checkbox for our insistent Sales Manager, Laura Garza, and click Assign. Now that you’ve given Laura permission to view content, you’re ready for the next step of the apps lifecycle: sharing. This will let Laura see the great work you’ve just done. And through sharing, as she uses your app, you’ll all be collaborating and learning how to make the app even better. You're probably still in the Setup pages. For the next task, return to Analytics Studio. Look for the app you just created—My First Analytics App— in the Apps section of the Analytics Studio home page. Click the disclosure triangle to the far right of the app name, then click Share. To give access to Laura Garza, start typing her name in the lower section where you can invite others. Because you’ve set her up in your org, her name appears in a drop-down list after you type a few letters. Click her name to select her. Leave Laura’s access level as Viewer, and click Add. When Laura opens Analytics Studio, she’ll see the folder icon and she’ll have viewer access to the app. Bravo! You’re done—way to go! You’ve assigned a PSL to another user, created a new permission set, added permissions to that set, and assigned the set to the user. That’s a lot of steps, but it’s all about security, security, security! The same basic process applies to other app and users, even though you did all this using Sales Analytics. The differences are the permission set license (PSL) you assign, and the specific permissions you add to permission sets. Each app requires that you assign users the unique PSL for that app. And a different type of user—say an admin, or a power user—would require that you add other permissions to give them access to the app features they need. For now, pat yourself on the back, and take a few well-deserved deep breaths. You’re well on your way to becoming an Analytics guru!